Intersections, especially those with traffic signals, typically have road markings indicating the stop line for vehicles as well as the designated pedestrian right of way for crossing at the intersection. Most intersections also have a typical “yellow box” that is supposed to mark the area that is to be clear of any obstructions (including vehicles and pedestrians) in order for traffic to flow efficiently at the intersection. Despite these and the clear policy on where to stop at intersections based on traffic rules and regulations, many motorists choose to violate these rules and encroach or occupy space that is for pedestrians and cyclists. In the process, these motorists endanger the lives or limbs of people that they might hit as they attempt to get ahead of others. This propensity to “get ahead” or panggugulang in street lingo is widespread and indicative of how the poor discipline among motorists. The driver of this car seems to think he could get ahead of everyone else by stopping on top of the pedestrian crossing, which in this case is clearly marked. 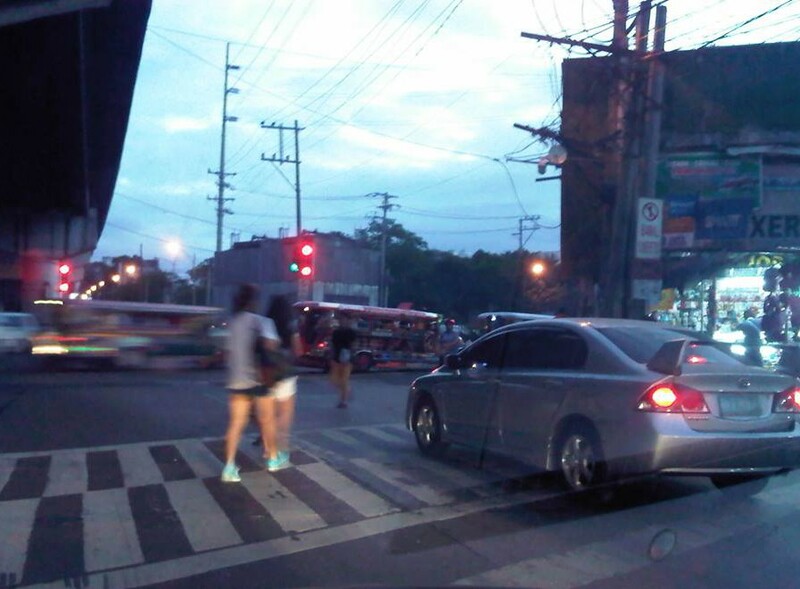 There are many cases like this and in some there are traffic enforcers that quickly approach the vehicle to accost the driver. In Makati, erring drivers immediately get a ticket or are fined for such transgressions. The photo taken above was in Quezon City at the intersection of Aurora Boulevard and Katipunan Avenue. There were a lot of enforcers there and very visible but they were only watching traffic and did not mind such cases. I think that if an enforcer was not deputised (i.e., not authorised to give a traffic ticket) then the least he/she could do was to approach the driver, inform him/her of the transgression and then direct the driver to clear the area (basically back up behind the crosswalk). If and where the enforcer is deputised, then I think they should issue tickets or fine violators to send a clear message that such actions will be penalised immediately and firmly. Word of such actions and their outcomes usually travel fast among motorists especially with social media these days expediting such information dissemination regarding transport and traffic in various areas in the metro. This would be a good way to influence people to improve their behaviour on the roads. By d0ctrine in Behavior, Pedestrian, Road Safety, Walking on March 10, 2015 .